Construction equipment is used for a variety of purposes like earthmoving, excavation, tunneling and heavy lifting. The equipment is used extensively to save time and labor across industry verticals such as building construction, mining and oil and gas. The market experienced a slowdown for several years due to economic stagnation worldwide and sluggish oil prices. However, increased infrastructure spending worldwide by public and private entities as well and growth in the real estate sector are expected to be the key factors propelling growth in the market during the forecast period. Growth in the mining industry could also act as a major boost to demand. Developing economies are expected to dominate the global market for construction equipment owing to rapidly rising developmental expenditures, which comprise largely of infrastructure spending. As per a UN report, Latin America spends the least on infrastructure among developing nations, while Asia spends the most. The global market for construction equipment was valued at USD 130 Billion for 2016. It is expected to grow at a CAGR of 8% during the forecast period and reach a market size of USD 240 Billion by 2024. Earthmoving equipment accounts for the highest demand among all types of construction equipment, owing to its benefits in terms of increased efficiency, cost savings and safety. Geographically, the Asia Pacific region has the largest market for construction equipment, followed by North America and Europe. High infrastructure spending in Asia Pacific is the key factor giving it the largest market share. China and India lead the regional market in terms of revenue. China is also a key manufacturer of construction machinery. As per the China Construction Machinery Association, the industry witnessed a 4.93% revenue growth in 2016. Construction equipment sales in India are expected to grow by more than 10% in 2017 alone. As per the Indian Construction Equipment Manufacturers Association, sales increased 41.5% from 2015 to 2016. The North American region witnessed a slump in recent years. As per the Association of Equipment Manufacturers, exports of equipment from the US fell by 25% overall in the first three quarters of 2016. As per the Committee for European Construction Equipment; slight increase in equipment sales can be expected. Overall construction equipment can be expected to benefit from rising disposable incomes and low mortgage rates. New residential construction grew by nearly 6% in 2016, and increased expenditure on infrastructure might fuel growth. Germany accounted for the highest revenue share in the region, followed by UK, France and Italy. 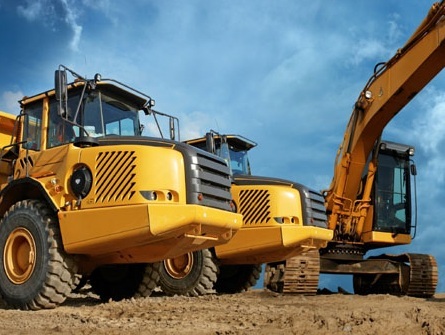 Global economic growth characterized by rising disposable incomes, increasing government expenditure on infrastructure, rental/ leasing trend and public private partnerships in the industry are the key factors driving construction equipment industry growth. Regulations on construction activities and equipment by governments worldwide, like Provision and Use of Work Equipment Regulations 1998 (PUWER), UK, act as hindrances for players in the global construction equipment market. Oil price movements, real estate sector performance and various geo political issues might also adversely affect market growth.